When I came to the U.S. for my graduate study in the late 1990′s, I brought with me two pieces of luggage plus about $150 cash in my pocket. Those were all I had at that time. Because I had an assistantship from the school, I thought I could get paid right after registration, so I didn’t bring any more money (well, I didn’t really have more anyway). That wasn’t the case of course. I didn’t get my first check until the middle of October. To get me through the first one and a half months without pay, I borrowed $500 from my friend to open a bank account and used the money to buy food and other necessities. It wasn’t very easy for sure. With only a couple of hundred dollar in the bank, I was very careful with the money so not to overspend what I had. However, even with a very tight wallet, I had to spend $80 on the most expensive item I bought at that time: a textbook on probability and stochastic process from a bookstore in New York City, for one of three courses I took in the first semester. It was a tough decision. On one hand, I really didn’t have much money left while waiting for my stipend. On the other hand, I couldn’t afford to fail later in the exam either (what I mean fail isn’t get a C or D) if I didn’t have a book since it was one of my major courses in my first year. That would put my assistantship in danger. Eventually, I decided to get the book and not to spend money on anything else that wasn’t absolute necessary. Students at four-year U.S. colleges spent $1,122 a year on textbooks on average in the 2009-10 academic year, the College Board reports, a 32% increase from five years ago. That’s a lot of money to spend on textbooks that don’t usually have a lot of residual values after the classes are over. While textbooks are at least as expensive as 15 years ago, what’s different between now and then is where to get the books, which could make a big difference in the money spent. Back then, there was no Amazon.com(?) and no any other online bookstores. 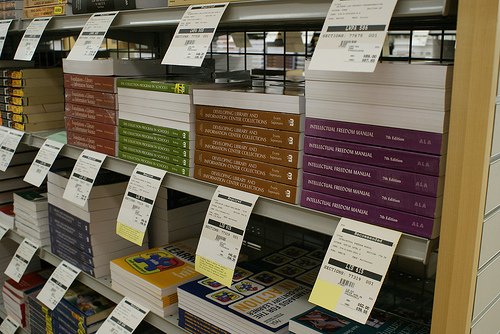 The only place to buy textbooks was campus bookstore, which usually had all the textbooks, but the prices were generally higher than other bookstores (but there weren’t many bookstores sell textbooks anyway). And if you want to buy a used textbook, Amazon.com marketplace is always a good place. The lowest price for the probably book in very good condition is selling at $38.99, even cheaper than a rental. And if you don’t mind reading a textbook on your computer, you can check out a website call CourseSmart.com, which let you purchase and download eTextbooks at a lower price than a paper book (I am not able to find the same probability book on CourseSmart.com to compare the price, maybe because the book is quite “old”). I think it also depends on your major. As a history major, I wasn’t buying a lot of textbooks, but more just history books of 200 pages or so on a specific topic. Some of those you can’t rent and it was cheaper for me to just buy them on half.com and maybe keep them later. On the other hand, for my electives like sociology and things like that, it might have been cheaper to rent, because I wasn’t going to be touching that introductory textbook again. I agree with renting textbooks. Your saving a lot of money. With three in college, I know thats right. I wish they had this when I was in college. I still have my “Introduction to Data Processing” textbook on the shelf. I think the time for buying book is gone. I just graduated and it has really become a trend to rent textbooks in the last 6 months or so then to buy a book. I graduated undergrad in 2009 and I fell in love with chegg my junior year, it cut my cost in half. I really like using chegg and Amazon often times you can get free shipping. I believe that’s a lot of money to spend on textbooks that don’t usually have a lot of residual values after the classes are over.So this is surely a good idea.